BOOKS of condolence have been presented to the family of the late Bishop Edward Daly in Derry. Mayor Hilary McClintock met Bishop Daly’s two sisters Anne Gibson and Marion Ferguson who were joined by the late cleric's housekeeper Betty Doherty and Fr Eamon Graham to remember the prominent church leader. 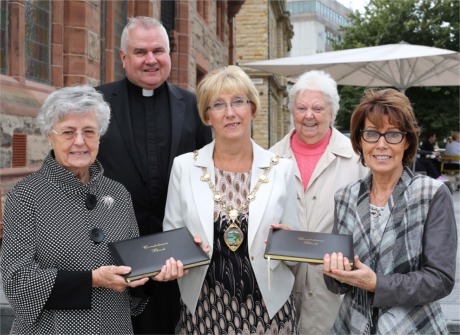 Mayor Hilary McClintock presents the Books of Condolence in memory of Bishop Edward Daly to his two sisters Anne Gibson and Marion Ferguson accompanied by his housekeeper Betty Doherty and Fr Eamon Graham. He died on August 8, last, after a battle with cancer. His month's mind mass took place in St Eugene's Cathedral, Derry, on Saturday evening. "Bishop Daly’s family were moved by the number of heartfelt messages of sympathy and fond memories expressed by local people across the city and district," said Cllr McClintock.